While past events focused on positive virtues or moral excellences exemplified by Lord Rama, this year paid particular attention to His consort, Sita. In Her manifestation as the goddess of fortune, the epic illustrates how Sita prospered when joined with Rama but caused devastation when separated by the evil deeds of Ravana. Based on this principle, the event was themed the ‘Culture of Wealth’ since this is a common element shared across both the festival and financial institutions. While lamps are used in the festival to encourage one on a journey of darkness to light, wealth plays a prominent role in ceremonies. Since wealth represents Sita, it is used in worship during Diwali and revered as sacred to inspire monetary values and culture. Although the Ramayana makes it’s apparent that wealth is sacred, and when personified as Lakshmi is the closest thing to God, we see that wealth sometimes harbours negative qualities such as greed, violence, and exploitation. 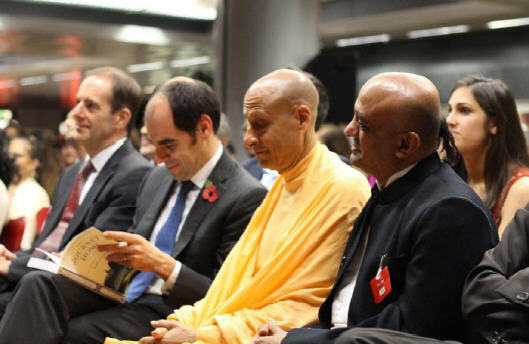 To address this contradiction between wealth impacts in theory and reveal how wealth can be sacred, His Holiness Radhanath Swami was requested to deliver the keynote speech. On account of the large specialist nature of the event, the festival hosted its best external speaker to date as rated by feedback. 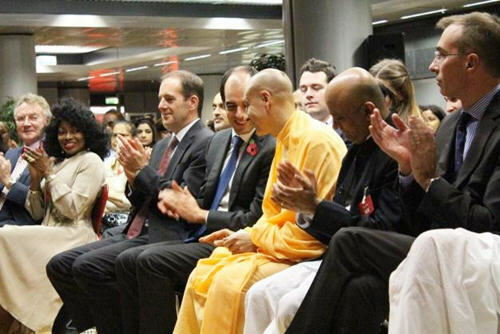 Since His Holiness Radhanath Swami received the largest overwhelming response from employees and clients of various natives and high appreciation from senior management, the event was proud to host him to deliver the keynote speech. 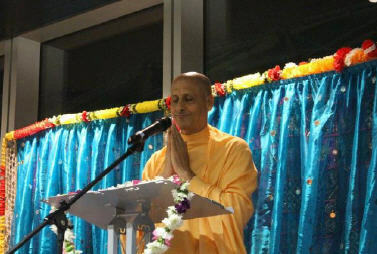 With his highly commendable ability to engage audiences, coupled with the precise professionalism to deliver Vedic themes at large unprecedented corporate levels, His Holiness is seen by many professionals as a unique spiritual ambassador to share and make themes from the tradition relevant to people of all walks of life. 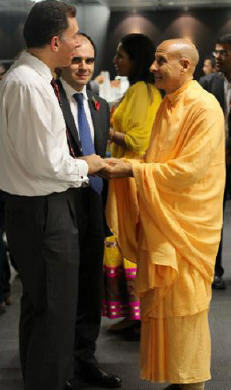 Having only just completed his final discourse to five thousand people on pilgrimage in the holy land of Vrindavana, His Holiness Radhanath Swami kindly travelled in all the way from India to attend. 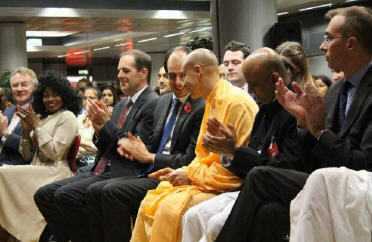 His Holiness was hosted and joined by the HSBC CEO of UK who is also the Deputy CEO of Europe. Since the theme directly addresses a topic much in need worldwide, the uptake to explore the theme was extraordinary. With limited seating only 500 bankers were admitted while the doors closed on an extra 400 bankers. Previous to the event His Holiness and Executives of HSBC met with 50 externally invited celebrities ranging from commercial businesses, showbiz and industrialists. Some guests travelled in as far as California, Silicon Valley, Singapore and India just to attend the event. The HSBC CEO for Insurances opened the evening by discussing the need for such vital topics to be explored and promoted to help improve the world. He elaborated how HSBC greatly values the cultural diversity in which they operate and therefore enjoy the opportunity to celebrate the richness of our cultures together. The second piece forms the melody of the hymns invoked at the time of creation by the celestial Brahma. While some traditions attribute a Big Bang at the time of creation, the Vedas base the creative impetus on melodious vibrations! 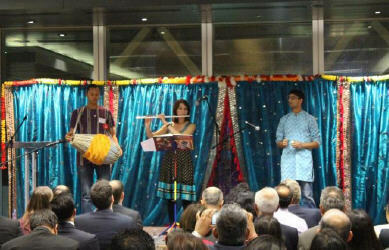 The final piece entitled ‘Raghupati Raghava’ is a popular Diwali melody that engaged the participation of the audience. Having resounded these poetic melodies some of which are sourced in ancient literatures, the event moved straight into the primary purpose of the gathering. 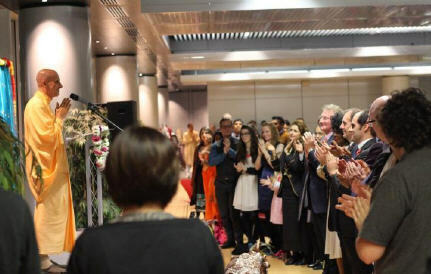 Having introduced His Holiness both from tradition and his diverse influence on an entire stream of groups, corporations and entities across the world, His Holiness began by invoking grace through a collection of Sanskrit hymns. His Holiness requested all to offer a prayer to those suffering in this time of great crisis within the Philippines. 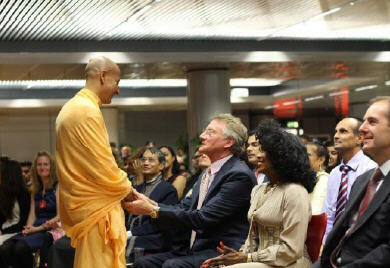 He added: “such sobering moments help us to understand what really matters in life.” His Holiness spoke on his previous global engagements with HSBC and concluded that he feels like he is coming home to family when together, despite not having a bank account since 1969! 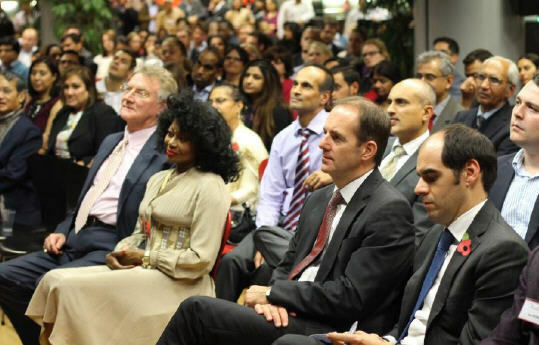 He continued to express how in his interactions with leaders of HSBC and those connected, he finds a real aspiration for making the world a better place through human values. Paraphrasing his talk at the House of Lords in April 2013, he commented how many people feel that a particular sentence transformed the way of thinking for many despite being such a common sense thing. He shared the quote: “You can understand how rich you are by counting how many things you have that money cannot buy.” When the CEO of a magnificent corporation in Chicago heard this statement a few weeks ago he became enthusiastic. That CEO began to list all such things that money cannot buy including: happiness, peace, values, families, relations and love. His Holiness questioned: “So why do you work so hard for money?” The CEO responded: “Because the other things it can buy are very nice to have!” In sharing this encounter, His Holiness discussed why wealth has both strengths and a need along with its weaknesses. His Holiness explained that the festival of Diwali is the most beautiful celebration in India; every home puts little lamps of oil flamed wicks on windows and roofs during the night. 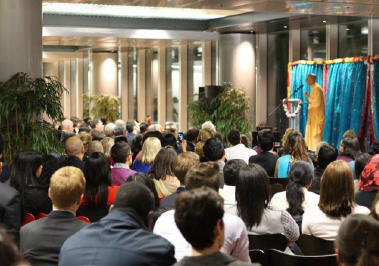 “The spirit of the festival is how light conquers darkness, how love conquers hate, how compassion conquers selfishness, how forgiveness and humility conquers arrogance and how selfless sharing gives deep fulfilment in our life.” His Holiness elaborated on the symbol of a flame and inner meaning of the illumination and warmth thereof. In the history of Diwali according to the Ramayana, Sita was described as the mother of all living beings. As a mother she nourishes all wealth, fortune, earth and the environment. To understand that all these are sacred gifts including health, intelligence along with wealth, and to use it according to that principle in our lifestyles – in banking, business, politics or wherever it may be – becomes yoga, a path of spiritual enlightenment. Next, the characters of Diwali were introduced to show what one can learn from their qualities. In the Ramayana, Sita was the consort of Rama who symbolises the highest virtues. For the purpose of honour, integrity and defending his own family, Rama accepted exile to the forest for 14 years leaving behind all of life’s comfort for higher principles. Ravana who was so immensely powerful and wealth had envy and selfishness breeding in his heart incredibly. Ravana felt that he had the right to do anything he wanted for his own purposes. As a result Ravana kidnapped Sita. Quoting the Brahma-sutra (1.1.12) which states ‘ananda-mayo ‘bhyasat’ His Holiness explained how every living being seeks fulfilment; true fulfilment is to love and be loved. While worldly things give temporary satisfaction to the mind and senses, only love can fulfil love to satisfy the heart. The real problem in this world was detailed as a hunger of the heart which exists even in the wealthiest people globally. “The origin of that love is between the true self and Supreme who we call Krishna or God in Sanskrit.” Using examples of global traditions, His Holiness showed how key people in ancient times made sacrifices for higher purposes. While Diwali teaches the principle of unity in diversity, His Holiness explained that to appreciate the sacredness of wealth one needs to appreciate the sacredness of life. This is done by identifying and appreciating that we are all part of the same creator whatever our religion, nationality, statuses or beliefs – we are all family. Real fulfilment in life is therefore according to what we have to do for each other. His Holiness described this as the essence of human values and all spiritual paths. His Holiness moved on to speak about future generations by highlighting that when we take responsibility for what we have to make a difference in the world, then our life becomes very meaningful. “What is the legacy that individually, as a family and society that we are going to give to the next generation? Our values and more than anything else our character is what will influence our children and grandchildren to lead meaningful lives. It’s not how much money we have thats important, but our love for each other.” His Holiness shared an insight into words of his father that he heard as a 10 year old. As a child he taught him that we work to do the needful in this world but not to be misled; it’s the values we hold that are important in life. Even if one becomes very wealthy these principle should never change but be the foundation of life. While the assembly started an ecstatic round of applause they followed the CEO to give His Holiness the highest honour of a prolonged standing ovation. For the world’s largest bank primarily interested in managing money, it is exceptional, unique and extremely difficult for an assembly from all walks of life, levels and intellect to unanimously all offer a standing ovation for any speech, let alone one made by a Swami without any banking experience whatsoever. It will be a great challenge for one to replicate the honour received to make history again! The second reason is because of the philosophical messages surrounding the event. Paraphrasing His Holiness on the legacy that we give our values to the next generation, the CEO demonstrated the usefulness of promoting such wisdom. He went on to describe how this aspect of the keynote speech is more important in banking than any other industry because in the UK, banks have failed society. Therefore values are extremely important for the banking industry; the idea of responsible banking is required to be re-emphasised all the time. 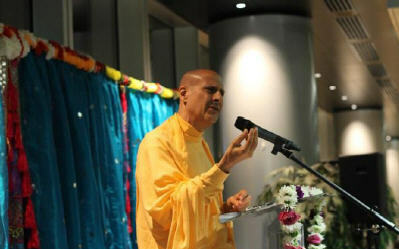 This second reason of the spiritual side of the festival was therefore concluded as greatly important to support. 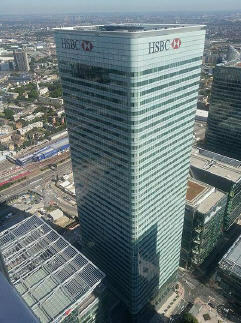 The third element covering wealth, the aspect of divinity in wealth, and the representation of wealth through Lakshmi the goddess of fortune was highlighted to be a great alignment with HSBC strategy. Understanding the value of money is important for society along with it being used for the good of society. In expressing the purpose of the bank to serve customers and protect their wealth, the CEO closed his speech by saying that there is a great alignment to the event since HSBC follows the values of Diwali in treating wealth as sacred. The event ended with networking over a full festive feast. Questions and answers between attendees and His Holiness continued till late in the evening. The overwhelming interest of the assembly with the keynote speech led to the collection of 500 copies of the autobiography of His Holiness, The Journey Home. The first of which was received with great joy by the hosting CEO.